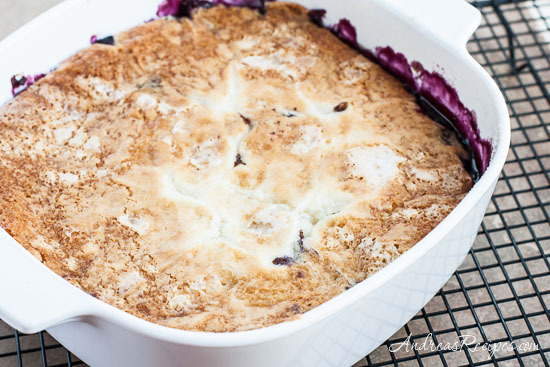 Blueberry pudding cake is one of those desserts where you swear the first time you make it that the recipe is wrong. You may look at the pan after you pour in all that boiling water and say to yourself, “There’s no way this is going to work.” I thought exactly the same thing, but it does work. 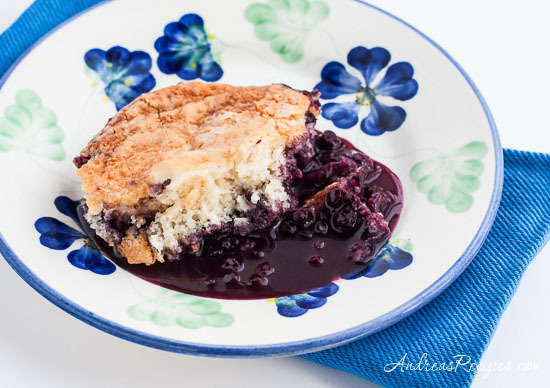 During the long stay in the oven, the boiling water combines with the thick batter, creating a kind of crunchy cake topping that floats on top of the juicy blueberry filling. It’s rustic and homey, almost like a cobbler, and tastes best served warm with some vanilla bean ice cream or gelato. Michael’s mom made this for us last summer, and we all liked it so much we couldn’t wait to make it when blueberry season came around again. The preparation is very easy and it only takes a few minutes to put this luscious dessert together, then the oven does all the real work. Adapted from Ann Meyers (from an old magazine). 2. In one of the bowls, toss the blueberries with the cinnamon and lemon juice. Pour into the prepared baking pan. 3. In the other bowl, whisk together the flour, 3/4 cup sugar, and baking powder. Stir in the milk and melted butter. The batter will be very thick. Spoon over the blueberries. 4. In the same bowl, stir together the remaining sugar and cornstarch and sprinkle over the batter. Slowly pour the boiling water all over the pan. The water will rise up and pool, but it will combine with the batter as it cooks. 5. Bake in the preheated oven for 55 to 60 minutes, until the cake tests done and is golden and a little crunchy on top. Serve warm with ice cream. Just in time for my neighbor’s blueberry patch to offer up this year’s goodies. What a great solar recipe! Especially for demonstrations. Thank you for sharing. yummy! I’ve seen chocolate versions of this, but never blueberry. This looks awesome! Recipe is printed out. This looks fabulous. Thanks for posting it! It’s been a while since I’ve had a pudding cake. This one looks delicious! Has anyone tried this using Splenda? Hi Deborah. I don’t cook with the Splenda baking mix, so I’m not exactly sure how it would turn out. Andrea, this looks like such a wonderful seasonal dessert! I’ve made chocolate and lemon pudding cakes but never with blueberries. I can see this recipe with the blueberries replaces by blackberries, too. Bravo! Oooh, pudding cake! What a great combo, this is making my mouth water. I would also consider your cherry idea, yums! Hi Jen. Thanks for catching that error, I corrected the recipe.